In 14th-century Cumbria (today a county in northwest England), residents in an extremely small, isolated village have gotten wind of the imminent approach of the Black Death. A local boy named Griffin (McFarlane) has been having visions about how to avert the plague, which seems to involve digging copper from a local cavern, casting it into the shape of a cross, and placing that cross “atop the highest church in Christendom,” wherever that is. Furthermore, all of this must apparently be done before the next full moon. The task seems impossible. For one thing, it’s the middle of a pretty harsh winter, with foot travel difficult at best. There’s also the fact that nobody in the ramshackle, illiterate village has ever been to a city, any city. They’re so far out in the boondocks, in fact, that all they “know” about cities is that they’re very big and very, very far away, over mountains and across seas. Even if they decided to accept the challenge, they’d have only the vaguest idea of where to go. A possible solution to their dilemma appears in the form of Connor (Lyons), Griffin’s strong, able, and much-admired older brother, who unexpectedly returns home from a bout of adventuring. At first, Connor is reluctant to get involved. He has seen so much disease, death, and sorrow in his travels that he’s simply too weary to head out again so soon. There’s also the fact that his wife, Linnet (Peirse), is about eight months pregnant with their first child. Besides, Connor says, in his travels he has seen Death skip entire regions, and as remote as they are, there’s probably a good chance they’ll be spared. 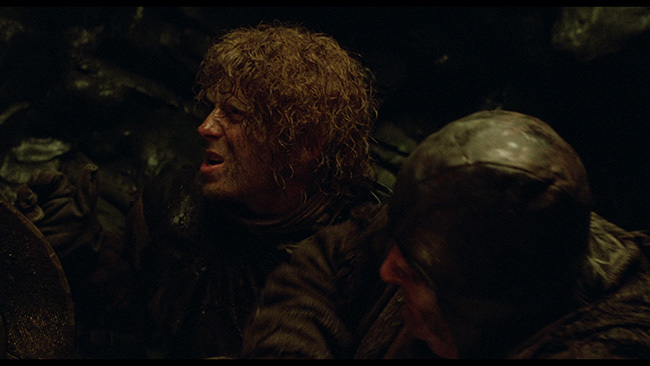 Soon, however, the fears of the villagers and Griffin’s persistence wear him down, and Connor agrees to take charge. An expedition is assembled, and it is agreed that Griffin, despite his young age, will be brought along for the guidance and information his visions impart. Said visions direct the group to a large mechanical drill that not only helps them dig up the necessary copper to bribe Jesus with, but to burrow deep, deep into the Earth as they do so. After an unspecified amount of digging, they hit a tunnel that, it turns out, is part of a large city’s sewer system. And that city, it turns out, is located in New Zealand… in the year 1988. Since they have no frame of reference by which to judge their surroundings, nothing about the skyscrapers, streetlights, or busy roads tips them off to their situation. 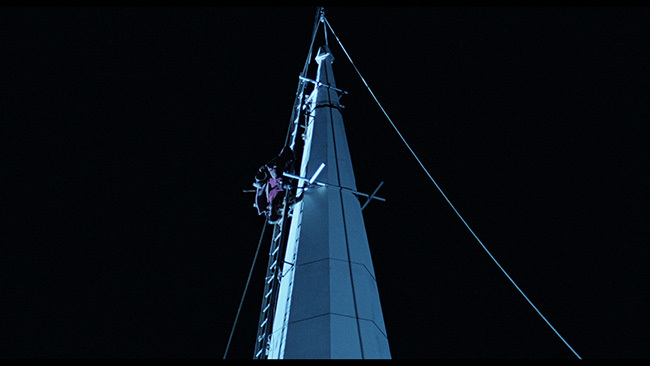 Undaunted, they proceed with their mission to find a blacksmith, cast a copper cross, locate the city’s tallest church, and place the cross atop its steeple before the full moon appears to seal their village’s fate. Lest anyone get the wrong idea, Australian/New Zealand co-production The Navigator is not even remotely a comedy. It’s a non-linear work of either drama, science-fiction, or fantasy, depending on your interpretation of what is and isn’t intended to be real. Are Griffin’s “visions” literal glimpses into the future, flashbacks of an adventure already passed, or fever-dreams brought on by an onset of the plague? What exactly is it that carries the adventurers to and from 20th century New Zealand? 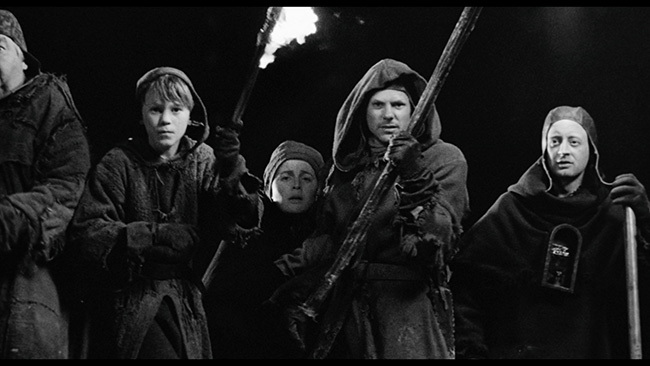 Director Vincent Ward provides some sort of clue by shooting the scenes in the village in black-and-white and everything else in color, but apart from that, he doesn’t do much to help the viewer sort things out. Still, it’s engrossing enough to make repeated viewings worth the while of anyone who wants to try and figure out exactly what’s going on. The Navigator was Ward’s second film as director, after the acclaimed Vigil four years earlier. He also worked as a writer on Alien 3 (1992), which he’d been slated to direct before creative differences with the studio prompted him to bail. He might be best known in the United States for directing the 1998 adaptation of Richard Matheson’s novel What Dreams May Come, starring the late Robin Williams. He was also an Executive Producer on 2003’s The Last Samurai. The film marks the second of two big-screen roles for Bruce Lyons, a Canadian who distinguished himself as an off-Broadway actor and a painter in the 1980s. His most recent screen performance was in the Canadian TV film Believe It, which he also wrote and directed. 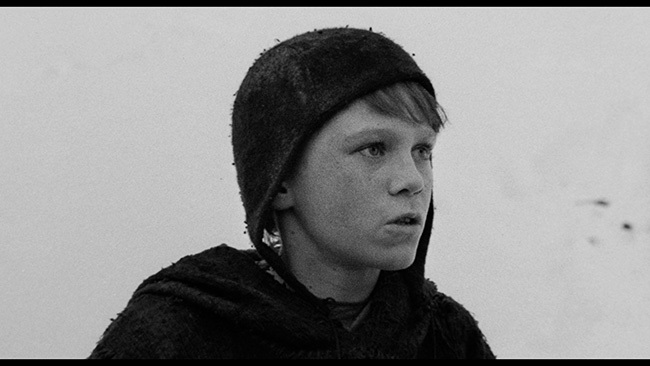 Hamish McFarland’s performance as young Griffin was his first appearance on film. His work here won him a Best Actor award from the Australian Film Institute. He did not pursue acting as an adult, choosing instead to work behind the camera as an assistant director and in other capacities. 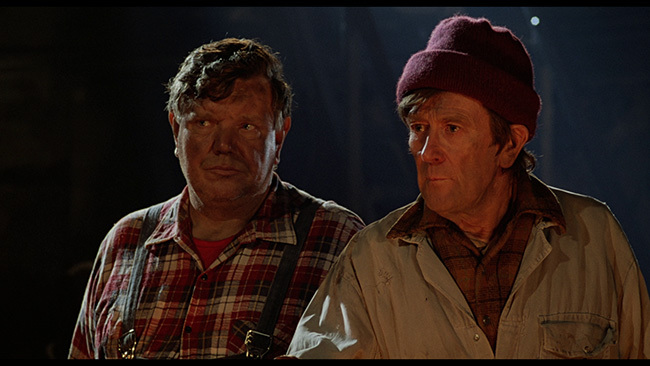 Noel Appleby likewise won an AFI award for his role as the sweet-natured but shy and somewhat stupid Ulf. He popped up as Everard Proudfoot in two Lord of the Rings films, The Fellowship of the Ring (2001) and The Return of the King (2003). But make no mistake: While all the performances in the film are solid, McFarland is the real prize, an actor of striking durability at so young an age, one capable of stealing a film from a stable of superlative adult performers. That the character also happens to be well written and developed—and the film on the whole the perfect showcase of McFarland’s talents—makes it all the sadder that he never pursued a film career. 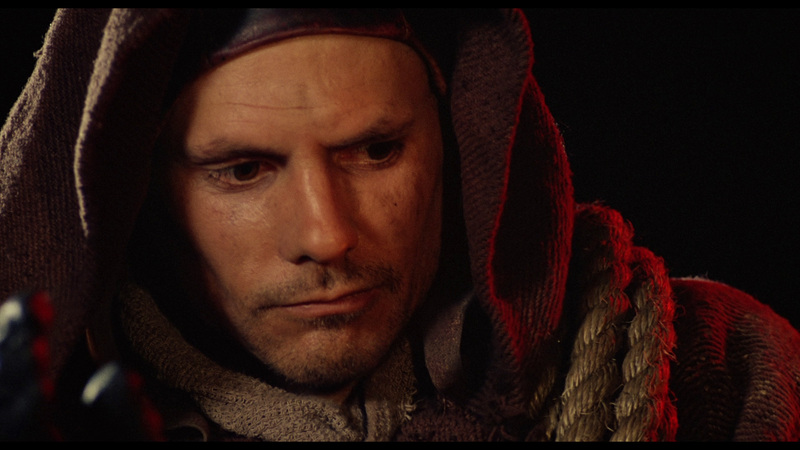 Arrow brings The Navigator: A Medieval Odyssey to U.S. shores on a Region A, MPEG-4 AVC-encoded BD50 with 1080p high definition at the film’s original theatrical aspect ratio of 1.85:1. 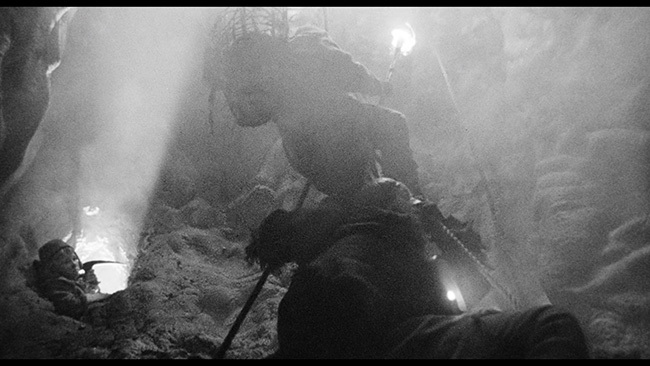 The film has been brought to Blu courtesy of “original film elements” and, for the most part, looks stunning, particularly in the opening and closing monochromatic moments. 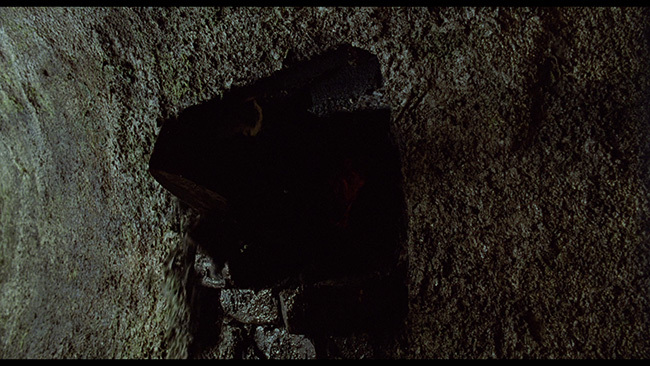 There are a few instances in which detail levels drop, suggesting that not all of it came from the same source (or that the film itself was shot in a couple of different formats), but this is far from problematic, as it appears to represent the vision intended by its director. There’s relatively little foliage in the film; the bookending segments take place in a snowy, barren landscape devoid of anything other than human life and full of rocky outcroppings, while the majority of the film takes place in brightly lit, mostly exterior city environs. In most instances, fine detail looks phenomenal, whether it’s the bumps and contours on actors’ faces, the brick and steel of the cityscape, the rough edges of hewn rock, or the antiquated clothing of ancient Cumbria. Grain is a little pronounced in those few scenes referred to above but overall is quite nice and foundational, shoring up the image without chomping down on the actual detail. 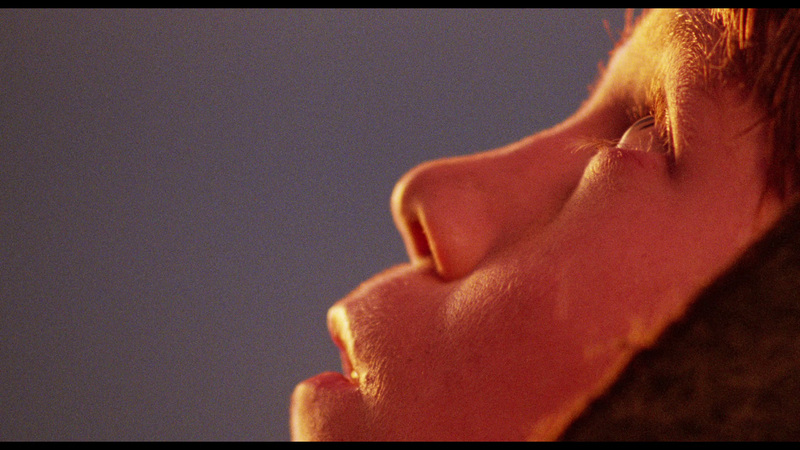 Given the nature of the film’s locales (the color sequences take place almost entirely at night, with a lot of artificial lighting), colors tend toward gold and amber. 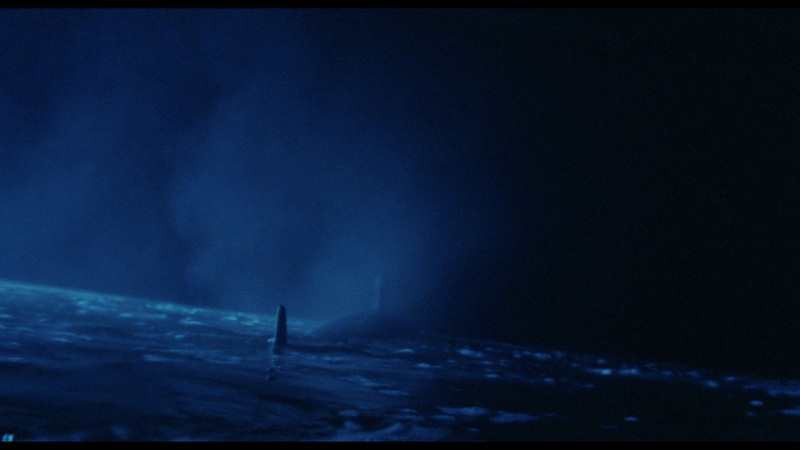 There’s little to no dirt and debris, yet the film looks like film, as it should. For the film’s soundtrack, Arrow has opted for a lossless LPCM 2.0 track that faithfully renders the film’s original stereo sound. Score, sound effects, and dialogue are nicely balanced so that conversations are easy to understand and the score is all the more effective by being ‘invisible’ to some degree. It accentuates what needs to be accentuated without diverting attention from the actors or the overarching story. It’s also as clean as a whistle. For American viewers unused to “accents,” Arrow has provided optional English subtitles for the deaf and hearing impaired. 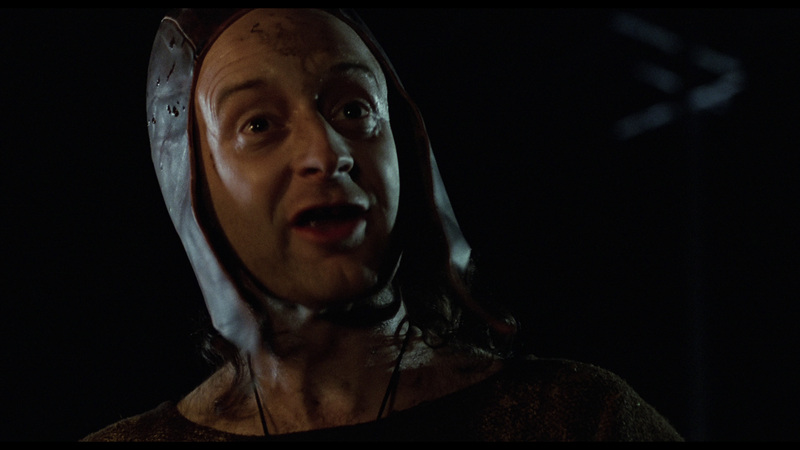 There are a couple of extra features, beginning with “Nick Roddick on The Navigator: A Medieval Odyssey.” Described as a “brand-new appreciation of [the film] by critic Nick Roddick,” it clocks in at 9 minutes. There are no subtitles, but Roddick is easy to understand; he begins by discussing the film’s financial backing before moving into its religious connotations. 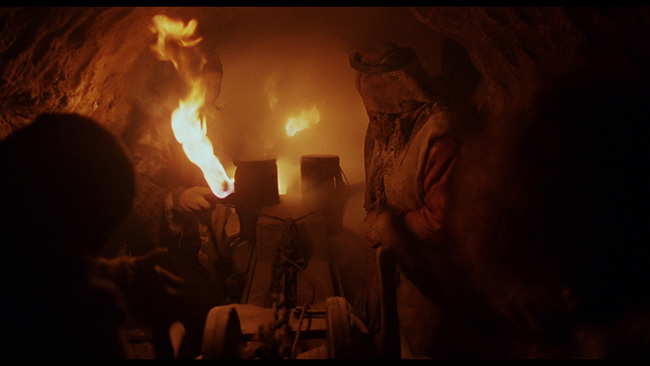 He doesn’t shy away from what he thinks doesn’t work (the “protracted” medieval scenes, for example), though he rightfully focuses on what does, as well as providing brief descriptions of the director’s other cinematic endeavors. Next up is “Kaleidoscope: Vincent Ward,” a 1989 documentary work about filmmaker Vincent Ward that contains interviews with some of the cast and crew he worked with, including some of the actors from The Navigator, as well as with his parents. This one lasts just shy of 30 minutes and is the more interesting of the two, perhaps because of its vintage nature. 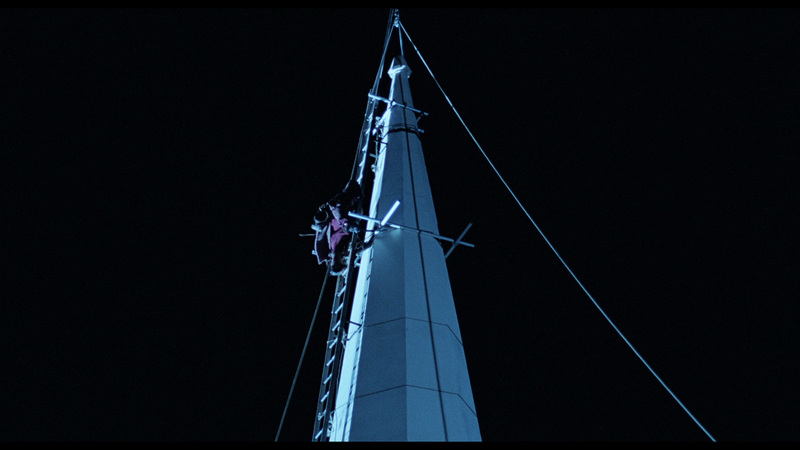 Concluding the extras is the film’s original trailer (2:25), which is presented in hi-def. The package comes with a reversible sleeve and a booklet, the latter of which was not provided to R!S!P! for review. 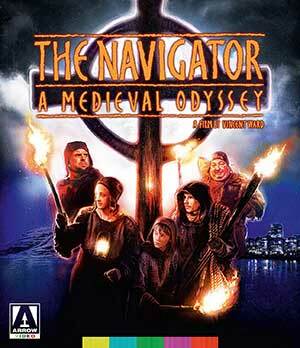 The Navigator: A Medieval Odyssey is a unique film, an arthouse release that works on a primal level thanks to a bizarre but captivating story—one that never fully gets resolved, leaving viewers to think about it long after it’s ended—and superb performances, particularly from leads Hamish McFarland and Bruce Lyons. Arrow’s release looks and sounds terrific, and the package offers some nice extras, including a vintage half-hour documentary about the film’s director, Vincent Ward. Click on the images below for full sized Navigator: A Medieval Odyssey screen caps!